Due to its easy to use interface and extensive wide database, YouTube is getting more popularity day by day. Youtube is the place where you can watch numbers of video without spending money. All you need an internet connection. Now every time you want to see the video you need an internet connection and this not possible. In that case, you can download that videos and see them anytime you want. Begin an Android user you can easily find numbers of video downloader. It is always difficult to find the best software. No worry! Here is the good news, we have listed Best Video Downloader for Android. With the help of these downloaders, you can easily download any video you want and watch them later, even without a network connection. There you go it will download that video for you, and now you can watch it anywhere you want. All you have to do just open the app and go to offline option. Tap on the video, and it will play. This is the best Youtube video downloader app. There is a problem also, youtube doesn’t allow to download all video offline. There are some videos which can’t be download. But there is no need to worry there are many another app which can do this task very easily. AVD Download Video is the best video downloader. The app has an elegant and clean interface. The unique part of the app is you can download the video from any site you want. The app has its own browser, you just search the video, click on the respective link of the video, when the menu appears on the screen, select AVD as the downloader and yes that done. Your video is downloaded into your phone or sd card. In Just, a few clicks and your favorite video are within your reach. The app also have the video player, so you don’t have to use any other Video player to play the video. The downloaded video automatically stored it into your smartphone gallery, either you can transfer it to your SD card for sharing the purpose. TubeMote is the app with a very simple interface there are not much of options you need to understand. The app has already listed the site, where you can download the videos from YouTube, Vimeo, Dailymotion, Facebook, and more. You just need to select the site and browse the video you want to download for later. Tap on the “+” button, and it will ask you where do you want to save the video. You can also create the playlist so; it will be easy for you next time you want to watch the video you can easily navigate there. There is also “Share” option so you can easily share any video you want. Social Video Downloader is another best tool to downloads the Youtube video. As the name says it has more social sites to download the videos. You can download Any Video from the social sites like Facebook, Instagram, 9Gag, Vimeo, SoundCloud, Dailymotion, Tumblr, etc. All you need to open the App and choose the social site and browse the video. Select the video and it will also provide you the quality options. You can download the video in many Quality: MP3, MP4, HD 720, HD 1080, 480P, etc. The VMate is a popular video downloader app for Android which comes with tons of features. You can watch and download videos from several places quickly. You can also watch movies; live TV, videos, music from hundreds of source. 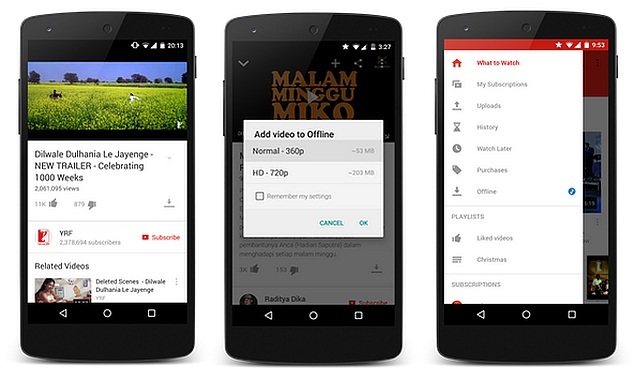 The App fetch the data from the youtube and let you download the videos. To download the videos you have to open the video and on the bottom of the video you’ll find the quality and download option. Choose the video quality and tap on the download option. There you go your video will be download with in few minutes, and now you can enjoy that even if you don’t have the internet. 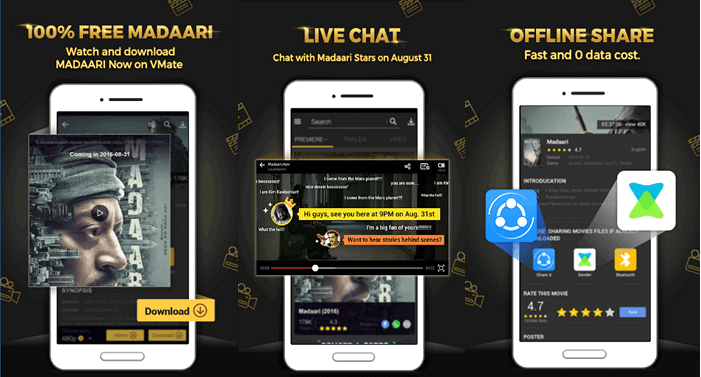 FVD is another video download App in free. You can download the video from any site. The app interface is not much fancy; it is a very simple app so that you won’t face any problem regarding interaction. To download the video, you need to open the app and Go to the browser, browse the videos by its name and open that. Now Tap on the download option, and it will ask you to choose the video quality select that as per your requirement and it will download. Now to manage you downloaded video here is also My video option. You can watch your downloaded videos over there. Full Video Downloader is the best app to download videos from the Internet to your Android device. It can download and save videos in many formats as FLV, MP4, AVI, MOV, MPEG, WMV, 3GP, MKV, etc. You will enjoy your favorite videos on your phone or tablet without the Internet connection. It automatically detects links from the Web browser, so you don’t need to copy and paste them into the app. You can resume, paused, and restart downloads whenever you want. The app also supports for large file videos (over 1 GB). The app is available in multi-language such as English, Spanish, French, etc. Videos were next big things to time pass and want to download them you must use the above mention Video Downloader Apps for Android. Among the various Android video downloaders, we have listed some of the best ones. Give them try and let us know which works well for you.